This beautiful Saturday morning blessed us with five petals. Too cute how did you make the sunflower emoji. Do I have that ability? Teach this old dog some new tricks! Do you have my email? I just realized that I have the keyboard that has emojis on it. I usually post from my desktop and I downloaded it (or found it) in Windows 10. I think I’m at my max for learning Windows 10. Hopefully they won’t change it again for years!! It’s a beautiful day here, so I’m headed outside. Enjoy your weekend! Ha ha! I’m afraid I’d get lost in Windows 10. Bravo to you. Oh, I’m so glad to hear it’s beautiful there. Guess the heat broke. Have a great day!! So beautiful! Just like a new born baby! Hey girl, how are you today? Thanks. Mother Nature makes it pretty easy. Isn’t it amazing that something so beautiful comes from a little bitty seed? i really like your blog-so positive and inspiring! I am looking forward to more posts-thank you for visiting mine too_I think we may have a lot in common! I absolutely LOVE your blog. I’m pretty sure you may be right about having a lot in common. Your posts are so awesome. I love the layout and your writing. It feels “down-home” to me and fits right in with my Iowa roots and small town living. awwh-this may be the beginning of something beautiful-thank you so much! Woo hoo!! 🎉 That’s so awesome! love that you captured this! Yes ma’am, I was back out on my trusted stool a few times today. Got some really good pictures. 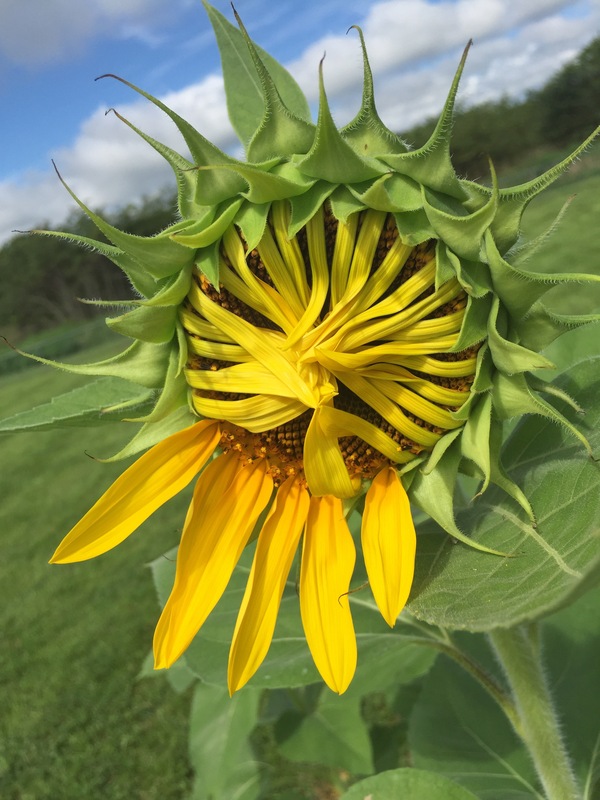 At last glance, Miss SUNflower only had 11 petals to go to be a full burst of yellow! How lovely! :) Happy Sunday, Jess! Skipton was fabulous, but I’m back to the mundane now. :) Never mind- it’ll make some nice posts. That’s kind of ironic, I’ve been working on a post called “The Beauty of the Mundane”.